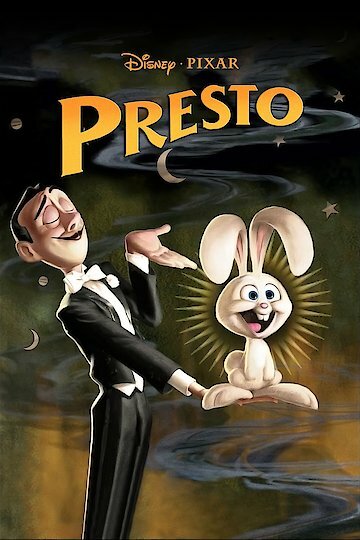 "An Amazing Five Minutes Of Animated Fun"
Presto is a 317-second-length computer-animated Pixar short film from 2008 about a magician, the titular Presto, whom is known for pulling a rabbit from his magical hat. However, the rabbit, Alec Azam, gets fed up when his owner is late to arrive for a performance and goes on with the show without feeding Alec his carrot. Aware that Presto's hat possesses a portal that links to an identical magician's hat, Alec decides to screw around with Presto's performance until he is given a carrot by using a variety of spatial and physical tricks to harm or harrass the stage performer. Presto is currently available to watch and stream, buy on demand at Amazon, Vudu, Google Play, iTunes, YouTube VOD online.